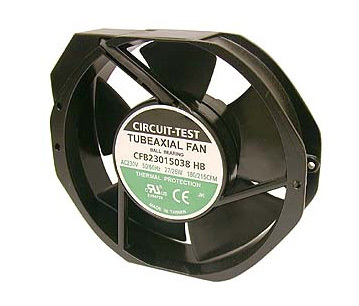 These AC ball bearing fans are constructed with a die-cast aluminium housing and plastic impeller. Operating temperature rated at -40 C to +70 C. CSA and UL approved. Dimensions: 150 x 172 x 38mm (5.9 x 6.8 x 1.5") Mounting Center: 162mm (6.38") Voltage: 230 VAC Air Flow: 212 CFM Power: 26 W Ball Bearing Plastic Impeller Speed: 3400 RPM Noise: 58dB (A) Weight: 720g Connection: 0.125mm(1/8") Terminals.